Sometimes life feels like a tangled mess. Guess what I saw today. I saw a skein of yarn in one big tangled mess. Oh, no! It would take hours to untangle that heap of knotted twisted yarn. And it happened at the worst possible time – right as I was changing colors of yarn in the middle of a knitting row. I put my big girl pants on and started in on the arduous task of untangling that yarn. In the process, I learned a lot about how to untangle yarn. I also realized the same principles of untangling yarn apply to the tangles of life. These seven steps will help you unravele any tangled mess. 1. DON’T linger on guilt. I could have managed my yarn better. I should have looked more carefully for the right end. Why do yarn companies make yarn skeins so convoluted anyway? Casting blame on myself, others, or yarn manufacturers wastes time and does nothing to solve the current mess. Yes, I need to learn from my mistakes so I can do better next time, but for right now, I need to let it go, and move on so I can attend to the task at hand. Like Scarlet O’Hara – I’ll think about that tomorrow. Paul had a lot he could regret. What a time waster. Let it go and press on. I’ve done my share of yanking at people and situations, trying to solve it myself and letting my emotions rule. It doesn’t work in solving relationship issues any better than it works in untangling yarn. Pass my growing ball of yarn underneath another strand. Sometimes the fix is so easy! I’ll gently pull apart what I thought was a knot and a whole bunch of yarn comes free. That’s so true in life. There’s always more than one way to do any task. We so often stay in our tangled mess longer than we need to because we’ve convinced ourselves there is no way out. Take a deep breath and allow yourself to find creative solutions. 5. Walk away. I could spend hours upon hours unraveling that skein of yarn when I could continue to work on the afghan I’m making, write, or do so many other things. I wound enough yarn to be able to continue the next section of my afghan. Over the last few days, I’ve set the timer for ten minutes and unraveled yarn for those ten minutes. You see, I don’t NEED the entire skein right now, so why waste time doing something that isn’t urgent? Besides, if I stubbornly persisted, I would get tired and start pulling – which we know makes a bigger mess. It’s easy to view our tangled mess under a microscope lens which deceives us into believing it is the most important thing. Sometimes, the best thing you can do is to walk away from the messy knots in your life so you can attend to other important issues and life events. Getting away for awhile will give you new perspective. 6. Cut your losses. This is hard. I have so many reasons why I shouldn’t clip the yarn and start a new ball. I’ll have to tie ends in the middle of a knitting project and then my knitted item won’t be perfect. Perfect is so overrated. The only one who will notice is me and maybe a county fair judge or my knitting instructor. That’s all right. Life is full of tangles and loose ends. It’s just that way. At some point, we need to learn to live with imperfection so we can focus on the greater good. If you don’t ask for help because you are embarrassed about the tangled mess, relax. The person who can help you probably already knows about the mess. Your goal is to get out of the mess and having someone help make the job faster and easier. God is our best help. He may not join us in the flesh to untangle a skein of yarn. But he is available for our other tangled messes of life. He’s invited us to take His yoke upon us because His yoke is easy and His burden is light (Mt 11:28-30). When we share our messes with Him, the weight of the mess is lighter. 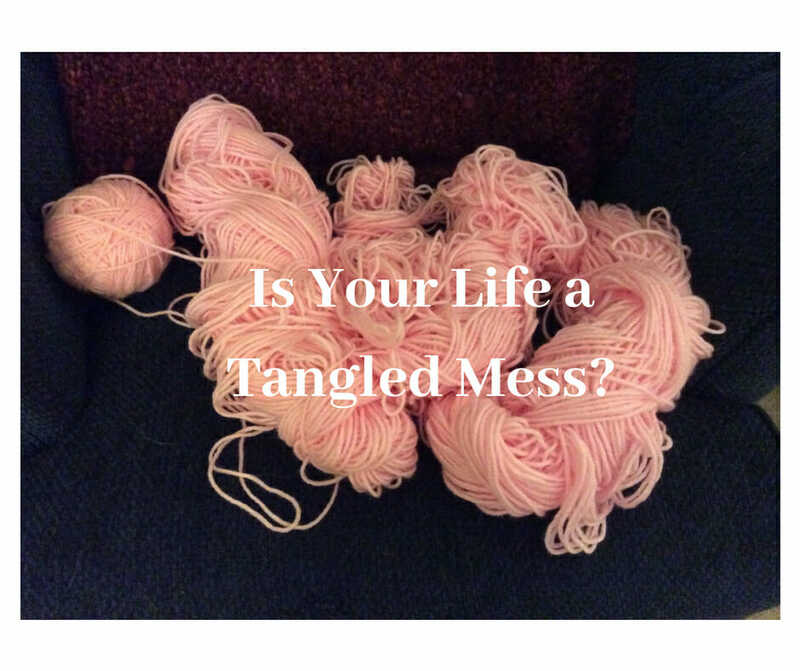 What tangled mess are you in? Do you feel like the farther you go, the behinder you get? You solve one problem only to unearth ten more? Too many Murphey moments – where if anything can go wrong, ten things will. Don’t fret, don’t blame, do take a deep breath, do the next thing, be creative, let the less important go, and be humble enough to ask for help. God can and will untangle your mess – one strand at a time. One day, you will be completely free.